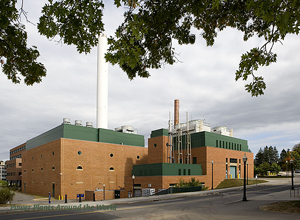 UConn’s state-of-the-art Co-Generation Facility opened in February 2006, replacing several oil-fired utility boilers and enabling the University to meet its own energy needs at the main campus. Natural gas, a cleaner burning fuel, is used by the facility to generate electricity and steam for heating and evaporative cooling. Also, the inclusion of steam production in the process removes the need to construct separate steam-production facilities that would burn their own fuel and have their own emissions.